Bilt Rite Scaffold has recently undertaken a momentous task to provide pedestrian safety while an iconic building in Austin is having repairs done to it. The 56 stories tall Austonian is undergoing emergency maintenance on many of its concrete balconies during a 16-month long renovation that should wrap up in April 2019. This work necessitates the ability to remove approximately 2 inches of concrete in order to access the rusting rebars that is causing portions of the balconies to crumble. The steel rebars will be replaced by glass fiber reinforced polymer to prevent any further rusting of support foundations in the future. In order to ensure pedestrian safety from falling debris, Bilt Rite Scaffold has erected over 750 feet of overhead protection as well as a material and personnel elevator for safe transportation during this critical overhaul. 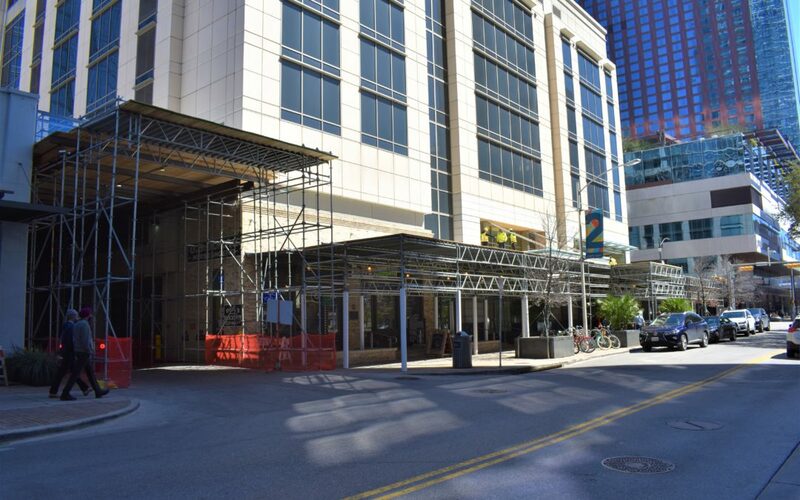 PVC pipe was customized and fitted around the scaffolding pillars that straddled the entrance to the retail location providing an aesthetically pleasing sight and minimizing potential injury from colliding into the pillars. 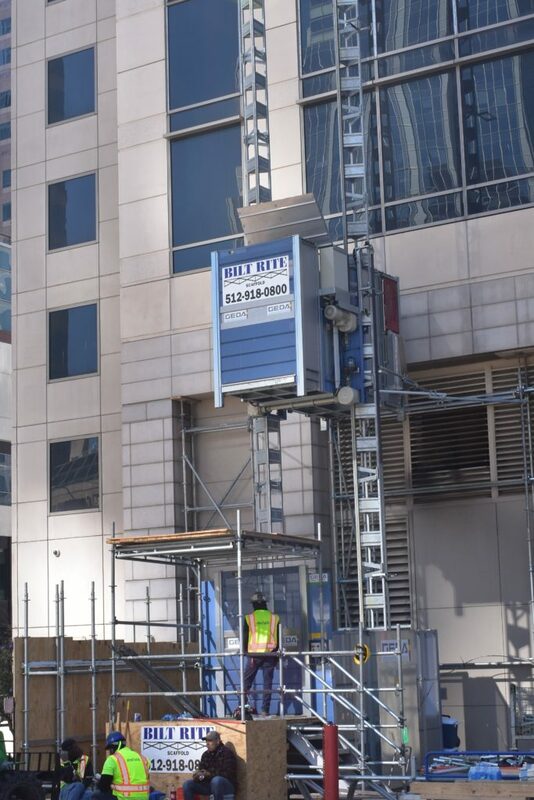 Additional bracing was also erected in vicinity of the shop, over-engineered, as per Bilt Rite standards, to ease customer concerns of the dangerous work taking place hundreds of feet above their heads. Safety considerations about the stability of the concrete balconies has been a reoccurring issue since 2014 according to The Austonian Condominium Association. After a 6-foot concrete section went tumbling off the side of one of the units and narrowly missed a staff worker standing on the 10th story dog park in 2015, the association hired an independent engineering firm to assess the structural integrity of the balconies. Pedestrians easily transverse the sidewalks with the reassurance of Bilt Rite walkways. 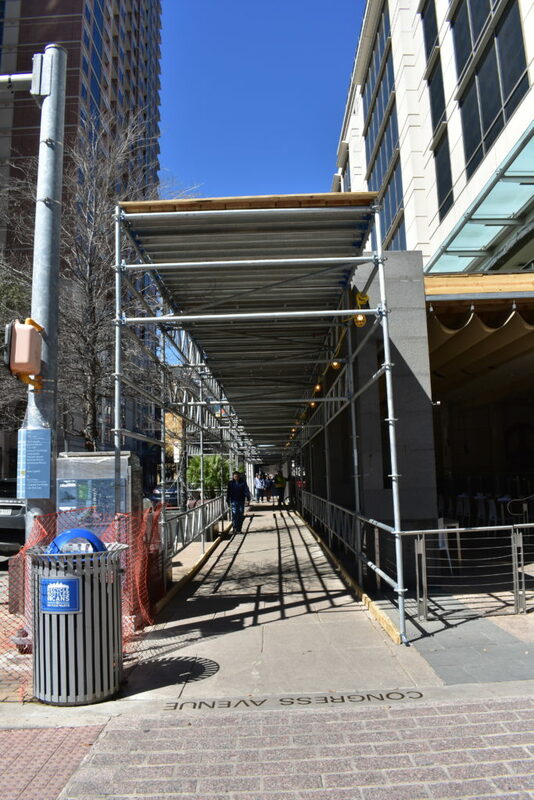 Bilt Rite Scaffold, as the premier scaffolding provider in Central Texas, will continue to utilize their expertise and rigorous safety standards to ensure that any possible overhead debris from this project will not cause injury to bystanders in this high foot-traffic area of Austin. Looking for a scaffold system? Don't look any further Bilt Rite has you covered! Ryan and Carey answered all my questions and I had access to my scaffold system in minutes. Very professional service with reasonable pricing. I can highly recommend this place. Great prices and service! You can tell everyone at this company really cares about their work and making it a great experience for all involved! What can't I say about this place wonderful employees, great rates and exceptional service. Had a last minute order needed in austin, was fulfilled and made my schedule. Highly recommend these guys! Best scaffolding company in all Austin, TX Fast working & Friendly staff. Very attentive to the customers needs! We PEREZ CONSTRUCTION SERVICES give our most honest recommendation! WilliamPi on Just turned 10!